Valentine’s Day, it seems that you either love it or you hate it. It really has become a commercialized holiday and can put a huge dent in your wallet. If you are on a budget or just want to give someone special something from the heart then I have a gift idea for you. 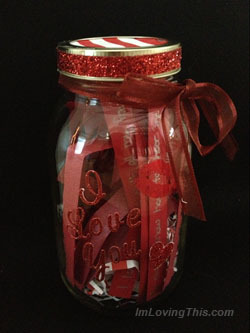 A Love Note Jar. A jar full of reasons why your significant other means so much to you. You could also do this for a friend or family member as well. The possibilities are really endless and I will list some other ways you could switch this gift up later on in the post. 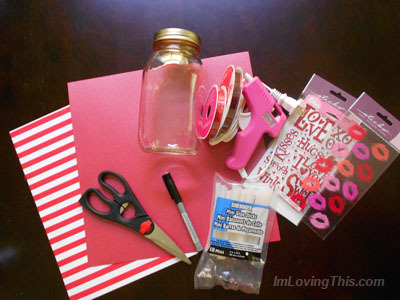 You don’t need many supplies to make this Valentine’s Day gift and it is easy to make too. I purchased all the items for this craft from Michaels. The first step is optional, if you are using a mason jar it is a way to make the lid look pretty. Take a piece of your paper and trace around the lid of the jar. Then cut the circle out. 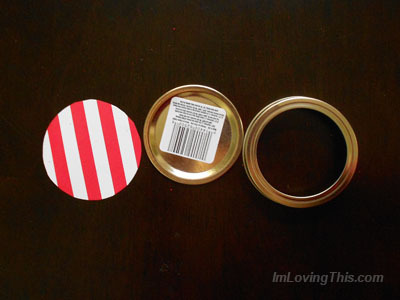 Next glue your circle onto the top of your lid and set it aside. Just keep writing things like that out, one at at time. You will need to be able to cut the love note sentences apart from one another so make sure you leave enough space between each one. Click here to download 45 sentences that you can use for your project. Your next step is to cut the love notes apart up so you can put them in the jar. You may even choose to cut up the sentences in the download instead of writing them all out, but it more personal to hand write them out. Take your second piece of paper and cut it up into small strips so that it can be used as filler in the jar. When you have cut it all up srunch it in your hands and then place it in the buttom of the jar. 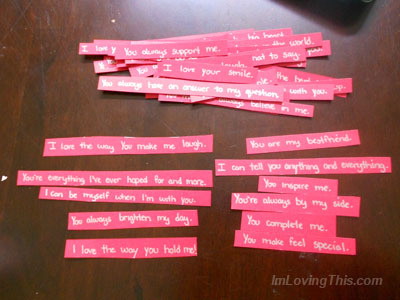 Next take all your love note strips and put them in the jar. You can choose to fold them or leave them open or do both. I had to fold some of mine as they were too long. I was going to fold them all but the opening of my jar was fairly small and I didn’t think a bigger hand would be able to grab the love notes out of there. 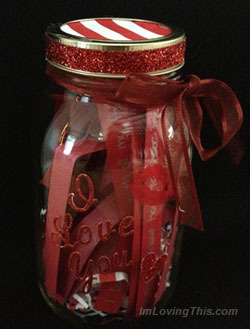 Put the lid on your jar so your love notes don’t fall out. Then take your stickers and stick them on the jar wherever you want. To finish it off glue some ribbon around the mason jar lid to make it look more decorative. Then tie a bow around the jar. And there you go! You have a thoughtful Valentine’s Day gift that only cost you a few dollars. If you make this gift I’d love to see a picture of it on my Facebook Page or you can Tweet it to me. Don’t forget to check out my other homemade Valentine’s Day gift ideas.